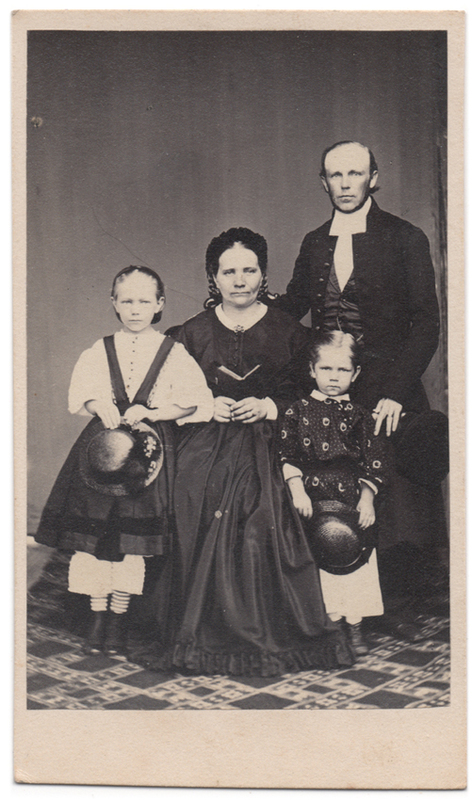 A photograph of an unidentified family, featuring two young girls and their parents; a gentleman with a recessing hairline, and a woman wearing a dress with a wide, billowing hem. To me, she seems to be the central figure in this image. She is surrounded by her family – the girls are leaning against her skirts, and her husband stands at her side, his right hand resting on the back of her chair. She’s holding a book, but looking straight at the camera. There’s an aura of calm confidence about her. It is obvious that this is her family. There is no information about the photographer or where this picture was taken, but I estimate it must be from around the 1860’s.